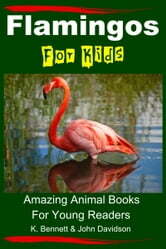 Bestselling author John Davidson presents "Flamingos For Kids – Amazing Animal Books For Young Readers". 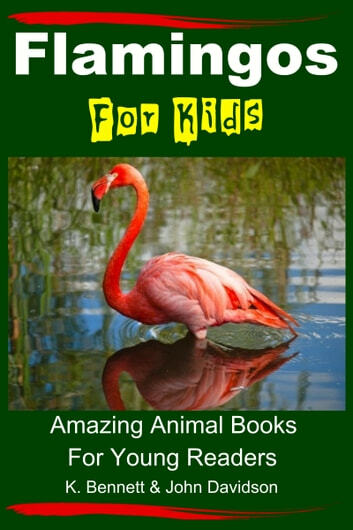 Beautiful Pictures and easy reading format will help children fall in love with Flamingos. This is one of over 30 books in the Amazing Animal Books for Young Readers Series. Lots of facts and photos will help your children learn about this wonderful animal. Children are given a well-rounded understanding of this beautiful animal: its anatomy, feeding habits and behavior. What’s the purpose of such an elaborate courtship? Have you ever thought of a bird in such a way? Flamingos are beautiful birds with a dazzling display of pink feathers. Of course pink is not the only color of the Flamingos plumes. The colors can range from red to orange, white and even blue, depending on what they eat! Flamingos live a very social life. They love to have friends and family all around, but not just one or two. Their colony can have hundreds, thousands, even tens of thousands at one time. An East African colony is famous for having more than one million members. Imagine how noisy it can get if they all squawk or honk at once! Do you know how old Flamingos are? How long they have existed? The Smithsonian National Zoo says their ancestry goes back for 30 million years, even more! So they are very ancient birds, and one of the oldest species known to humanity. Happily Flamingos are mostly calm, cool and collected. They love to stretch their long legs and ‘wade’ along the shore looking for food to eat. Sometimes they dine on shrimp, specifically brine-shrimp which contributes to their exotic pink tone. Even though human development has reduced their habitat to some extent, Flamingos still thrive in the coastal regions of South and Central America including the West Indies, the Galapagos Islands and other areas. Their colorful species are a beautiful part of life’s great mosaic of natural wonders.